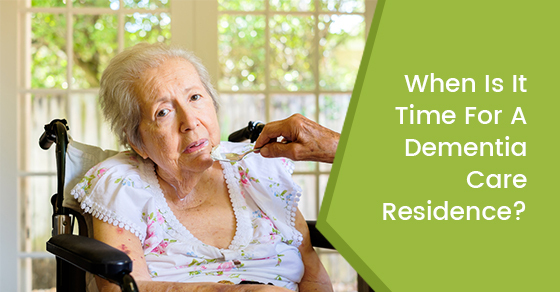 When is it time for a Dementia Care Residence? As people age, one of the most difficult processes to face is that of the decline in cognitive functions. The early loss of this function is classified as dementia, which can be a frightening factor of aging for the individual experiencing it, and for their families. The effects of dementia happen over time and can be overwhelming to a senior loved one. Both them and their family often become frustrated because of the gradual and progressive lack of communication. Your senior loved one will show signs of confusion, and the inability to understand what is going on around them, and often worst of all, who is around them. The time will eventually come when information on living in a care facility for dementia patients is needed. The onset of dementia will usually allow time for the family to discuss a care and treatment plan for the loved one. During the early stages, the elderly patient may wish to stay home because they think that the issue can be handled by themselves and family members. The progressiveness of dementia could be a slow process or an immediate one. The senior loved one may soon be unable to complete their daily tasks, including their self-help skills. Talking with the consultants at C-Care Nursing support of Toronto will help you make the most beneficial decision about the care of your loved one. Most people live a very fast paced lifestyle where every family member has a busy day, every day. They may find that taking proper care of their loved one is something that they can not do by themselves. The services provided by C-Care Health Services will enable families to continue their everyday living, and give a dementia patient the kind of care that they deserve. If being at home becomes too great for the dementia patient to face, a nursing facility or home is the best alternative option. The senior loved one will receive the ultimate in nursing care by a team of experienced and caring staff members. As the stages of Dementia advance, it may require that the patient is placed in a facility specially designed for the care of the disease. The qualified, expertly trained staff of C-Care Health Services will provide the most professional around the clock care for your loved one. Your loved one will be made to feel comfortable with their surroundings and become accustomed to the friendly faces. For more information on dementia care, visit the C-Care Health Service’s website here.